The Nintendo Switch added another indie feather to its cap this week with the release of Abzû, an underwater adventure game from Giant Squid Studios. The game‘s beauty translates exceptionally well to the Switch’s handheld screen — and if you have any fear of the ocean blue, it’s almost too good. In Abzû, you play a small, featureless being with flippers, exploring the ocean and activating beacons to cleanse polluted sections. I couldn’t tell you why — in that classic short indie game fashion, the game doesn’t deliver its story directly, opting to use environmental cues and visual markers in order to get its point across. But since the game is so short — two-to-four hours long, I’d guess — it doesn’t really need much in the way of story. If there’s one thing the Switch is darned good for, it’s consuming short but deep titles while sprawled on the couch before heading to the grocery store. See as well: Limbo and Inside. More so than the narrative, the game is famous for being absolutely gorgeous. It’s more of a spectacle than a game, a chance for the animators to get across just how stunning it is under the sea, accurately modeling oceanic life forms for the player to leisurely swim through. That beauty translates surprisingly well to the Switch’s handheld screen — it’s almost a marker for just how far handheld‘s have come in the last few years. There aren’t really any enemies in the game. The fish don’t bite, so there’s no real sense of urgency — you can explore as long as you like. The game also has stunning music that often syncs with whatever is happening in the game. It’s all very Fantasia. But there is one thing to be aware of in all this marine beauty. Abzû was originally released in 2016 for PC, PS4, and Xbox One. I never played the game that year for two reasons. One, other games distracted me. Two, I suspected it might trigger my mild-to-moderate thalassophobia. In case you don’t know, “thalassophobia” is an irrational fear of the ocean. There’s no root psychological cause in my case — I wasn’t dunked too many times in a swimming pool or anything. I just see a picture of bottomless ocean and my chest squeezes like the Kraken just reached out of those depths and gave me a tentacle-y hug. It’s why I can’t touch the likes of Subnautica. So, with respect to whether or not Abzû accurately portrays the terrifying grandeur of the ocean, I can give it a big thumbs up. There were one or two moments where I had to reach out and grab a table or pillow to ground myself because I made the mistake of looking down and got dizzy. I think in this case, the fact it was on the Switch handheld made it worse, since both the sights and the sounds were right in my face, and the Switch is such an absorbing console that it’s easy to forget where you are when you’re playing it. I could criticize the game for being shorter than the average Hollywood blockbuster, but honestly that works in its favor. Phobia or not, I think I could very easily get tired of the main character’s molasses-slow movement speed and the repetitive environments if the game had taken up more than a couple hours of my time. As it is, it doesn’t last long enough to sour its own first impression. That said, the game doesn’t have a huge deal of replay value. Even if I were to grit my teeth and give it a second go, I wouldn’t be looking for much besides the shell collectibles I missed, and you could fit my enthusiasm for that idea in a thimble. 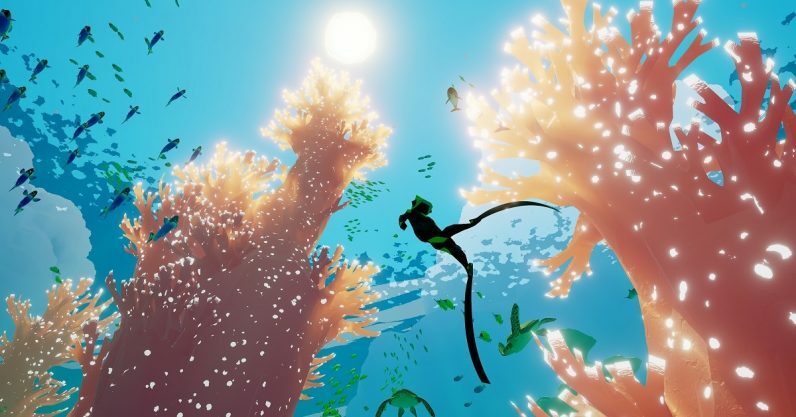 Abzû is a beautiful game that works well on the Switch and leaves a pleasant impression. As games go, it’s not exactly the most mind-blowing experience, but the visuals and short time span do make up for a lack of content. It is what it claims to be and does what it sets out to do, and that’s really all one can ask of any game.